The Glitzkoin team assembles some of the best talents in blockchain technology, diamonds, business management and marketing. In this report Rohit Agarwal, Tech Advisor at Glitzkoin, reveals his thoughts on blockchain applications that are developed for a specific business. Rohit explains that a standard blockchain crypto type of project, has few complications. The main element in these projects is the crypto token, it is listed on the exchange and the crypto community is expected to trade the token. Seasoned crypto traders have become weary of such projects, at the end of the day, these projects rely on nothing but speculation to deliver token price appreciation. Industry based blockchain applications, have also to deal with the task of convincing and training users to utilize the application. Rohit Agarwal says that, ‘… there is a bigger challenge that, presents itself even before user training. This relates to convincing industry experts and business owners, about the benefits of using the technology’. He adds that the Glitzkoin project was an exception as, it happened to be headed by a second generation diamond veteran. The CEO Navneet Goenka and Olga Rosina the Russian diamond expert on the team, had a clear idea of what the project was to achieve. The industry was constantly consulted and kept in touch with the entire project plan. The tech expert recollects that, one of the exciting parts of the DiaEx design process was, the mapping of the powerful features of blockchain technology to the weak areas in the diamond industry, that needed improvement. Rohit adds enthusiastically, ‘…. we ended up with the perfect fit, could not get any better…’. 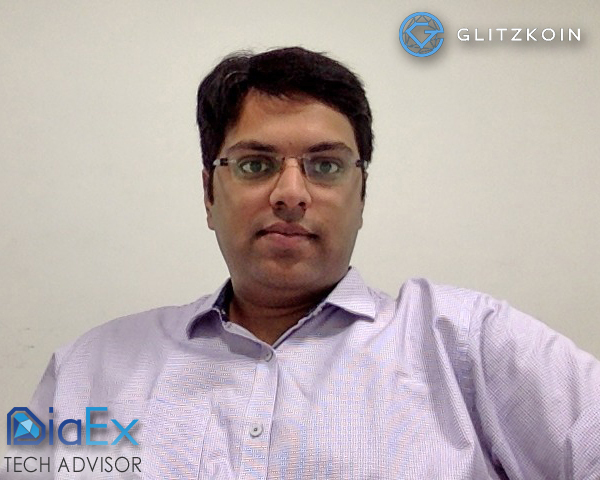 The Glitzkoin tech advisor had something to say about the Glitzkoin GTN token. In his opinion, crypto tokens are generally launched by blockchain projects to generate trading activity. Crypto centric participants trade the token on the exchanges and market mechanisms, play their role in defining token price. Rohit adds that ‘… the GTN token, was launched as a strategic part of the DiaEx diamond trading platform. Participants transacting on the diamond exchange, would use the Glitzkoin token to settle payments – no lengthy bank procedures and no hassles related to multiple currencies and conversions..’. He goes on to explain that, crypto space participants could still have their share of excitement. The GTN token could be purchased on the exchange and traded, just like any other crypto token. On a lighter note, he explains that, ‘… the crypto community would be thankful, for the added token demand generated by, traders operating on the DiaEx, diamond trading platform’. The Diaex diamond exchange is scheduled to be launched in the last quarter of 2018. The first batch of certified diamonds to be listed on the exchange, have been readied and have a total value of approximately, $500 million. That figure is expected to double within the first 3 to 6 months of operation.